IHG Rewards Club sent out an email about their 20% to 30% off MasterCard partner offer for stays in Europe until December 31, 2016, that must be booked by March 31. The discount is off of the Best Available Rate and there are more than 500 participating hotels. The discount usually applies for weekend stays (Friday, Saturday & Sunday), but some hotels may also offer weekday availability. Note that you must book this rate offer minimum of 21 days in advance. It is also prepaid, noncancelable and nonrefundable. The terms and conditions clearly state that this rate is qualifying for IHG Rewards Club points earning. The discount is 20% off of breakfast inclusive rates at InterContinental Hotels and 30% off at all other IHG brands including Indigo, Crowne Plaza, Holiday Inn and Holiday Inn Express. There were plenty of hotels offering discounted weekend rates using this rate plan. 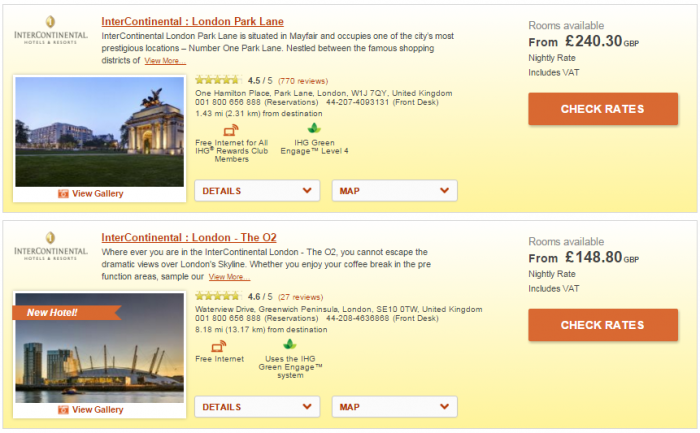 IHG Rewards Club has had similar partner rate promotions also in the past. I had some difficulty occasionally pulling the partner rates even when they were initially shown on the citywide rate search. Good rate offer to keep in mind IF you can plan minimum of 21 days in advance. 30% off Best Flex represents a minimum saving of 30% off our Best Flexible rate per room, per night for two adults sharing a standard double/twin room (inclusive of VAT). Bookings must be made at least 21 days in advance of first night of stay. Offer available for stays on Friday, Saturday and Sunday nights (with some limited midweek availability – please check when booking). Offer only available to eligible participants. Member ID or IHG voucher will be required at check-in as proof of eligibility. Participants must not send, circulate or distribute the offer to ineligible third parties, or otherwise allow them to make use of the offer. By taking advantage of the offer, all participants confirm that they accept these Terms and Conditions. IHG® Rewards Club points will be awarded for stays booked under this offer. Offer only available at participating European Crowne Plaza® Hotels & Resorts, Hotel Indigo®, Holiday Inn®, Holiday Inn Express® and Staybridge Suites® hotels. Offer available for reservations made between 1st January and 31st March 2016 for stays in the period 1st January 2015 to 31st December 2016. Offer available for room only bookings (breakfast not included) except for Holiday Inn Express® hotels where breakfast is included. Full payment must be made at time of booking; no amendments permitted; no refunds will be given (except where prohibited). This offer cannot be redeemed with IHG® Rewards Club points. Partner rate 20% off represents a minimum saving of 20% off our Best Flexible rate per room, per night for two adults sharing a standard double/twin room (inclusive of VAT). Reservation includes room and breakfast for up to 2 guests. Offer only available at participating InterContinental® Hotels & Resorts hotels in Europe.